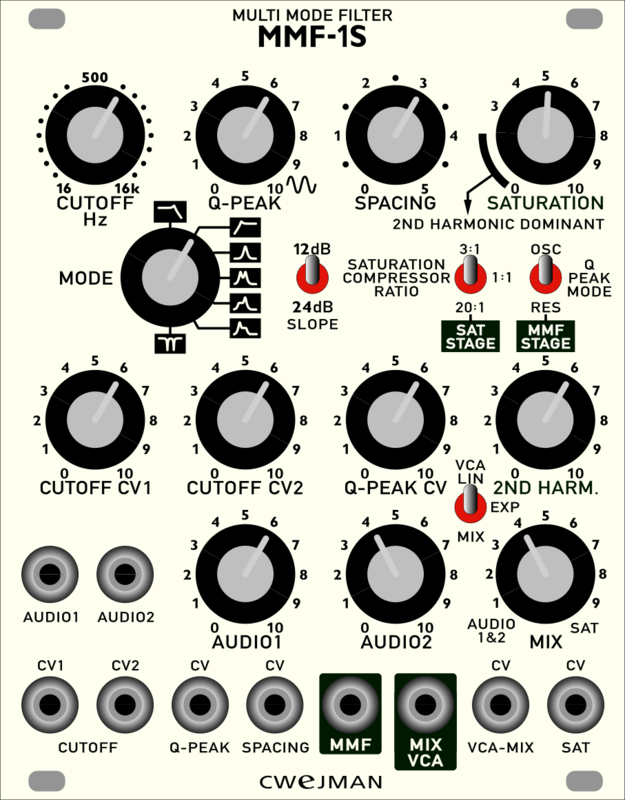 MMF-1S is MMF-1 plus (1)Compressor, (2)Resonator mode (Q peak mode), (3)Saturation, (4)2nd harmonic booster (2ND HARM), (5)MIX mixing original signal with (1)(2)(3)(4) or VCA mode. ( MIX VCA outputs ) . The SLOPE defines how steep the filter cuts off the attenuated frequencies. It means, that the 2 pole filter cuts signal with 12dB/octave, the 4 pole filter cuts with 24 dB/octave. The higher the slope, the more effective the filter cuts. The CUTOFF frequency or corner frequency defines at which frequency the filter starts to attenuate frequencies of the incoming signal. The cutoff frequency of the filter can be adjusted by CUTOFF knob from 16kHz to 16Hz and tracked by the external signals CUTOFF CV1 and CV2. The Q-PEAK (also known as “resonance” or “emphasis”) boost audio signals in the near range of the cutoff frequency and makes the tone sound more “cutting”. From a certain level on, the filter start o self-oscillate and works as a sine wave-oscillator and in dual band pass mode (in dual Q-PEAK mode) produces two-tone sine waves (the two-tones frequencies are controlled by CUTOFF and SPACING). The q-peak can be controlled by knob Q-PEAK and/or by signal from levelled input Q-PEAK CV, levelled by Q-PEAK CV knob. The SPACING control defines bandwidth for all three dual band pass modes and/or spread of two resonant peaks. The amount of spacing can be controlled by knob SPACING and/or by signal from input SPACING CV. The audio knobs AUDIO1 and 2 controls the audio signals level coming from inputs AUDIO1 and AUDIO2. The audio output is provided by output socket labelled AUDIO and is revealed by white surround. MMF-1S is the expanded MMF-1 with voltage controllable saturation with compression and second harmonic emphasis, then a MIX parameter for fine timbre tuning between original and processed distorted sound or a VCA at the output. The filtered signal is emitted at the MMF output. The second part of the module is comprised of a saturation stage which distorts the signal in a nonlinear fashion. Besides the voltage controllable Saturation parameter which sets the amount of saturation, there’s a 2ND HARM control emphasizing the second order harmonics. A compressor with three selectable compression ratios (1:1, 3:1 and 20:1) is integrated in the saturation stage as well. In switch position “MIX” the MIX parameter blends between the original signal (AUDIO 1&2) and the filtered/saturated result (SAT). This can be voltage controlled via the “CV VCA-MIX” socket. In switch position “VCA” the MIX control has no effect and the CV input “VCA-MIX” turns into the VCA’s CV input.